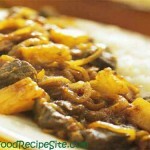 Heat the oil in a wok or large skillet and stir-fry the onion and garlic for 1-2 minutes, until starting to soften. Add the curry paste and stir-fry for 1-2 minutes. Add the coconut milk, stock, and lime leaves, bring to a boil and add the chicken. Reduce the heat and let simmer gently for 15-20 minutes, until the chicken is tender. Add the fish sauce, soy sauce, lime rind and juice, and sugar. Cook for 2-3 minutes, until the sugar has dissolved. Serve immediately, garnished with chopped cilantro. 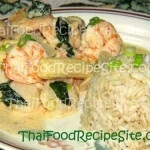 Have You Tried These Other Thai Curry Recipes? Dear Jesus, use all the ingredients in this recipe as nourishment for the body, working to strengthen and restore all who will partake of it. Amen.